When you use Google Analytics data to optimize your website content, you should be looking at more than just the traffic and page views. In this article, we focus on seven special Analytics reports that will help you to better understand your website users and their behavior. But what can you actually learn from this to help you optimize your website? You usually have to dig a bit deeper into other reports, and interpreting these can be difficult. This article will change that. To optimize website content, it’s important to understand the user’s intention, i.e. what brought the user to the website. The user’s interaction with the content also reveals valuable insights. If possible, any form of interaction that a user can perform with your website should be visible in the web analysis tool. Also think about benchmarking, AdWords and Search Console data. All of this together gives you a comprehensive picture. It can give you a “behind the scenes” view. Advice from the experts: You need to be sure that your Google Analytics account has been implemented technically correctly. You won’t be able to trust the numbers if not – this trust is a prerequisite for all the advice you can find in this article. In the main navigation point “Audience”, the sub-navigation point “Active users” is visible at the top of the list. This report shows incoming traffic at a glance for four periods of time – 1 day, 1 week, 14 days and 1 month. I would advise you to take a more segmented look at the report. You can read more about segments in Google Analytics here: Measuring content marketing success with Google Analytics. If the “Active Users” report shows unusual peaks and troughs, these are the times when traffic-peaks and traffic slumps have occurred on the website. Notes on the Google Analytics timeline, also called annotations (Figure 1), are valuable for this root cause analysis. If you consistently record all content marketing-activities using the annotations, you can quickly attribute traffic developments to a specific content marketing measure. Segmentation become even more important in cohort analysis, an additional report under the main navigation point “Audience”. At the time of writing, this report was still in beta testing. The term cohort originates from sociology and has been used in statistics for some time now. A cohort consists of a group of people who have certain characteristic in common. One cohort type is currently available in Google Analytics: The acquisition date (the date of the user’s first visit). For each of the previous 6 weeks, you will be shown how many first-time visitors landed on your website. In addition, the sales generated by these first-time visitors are shown, spread out over the six weeks following the first visit. Weeks in which some cohorts converted more than others are displayed in a darker blue (Figure 2). This report can be used to evaluate not only revenue, but also goals achieved. 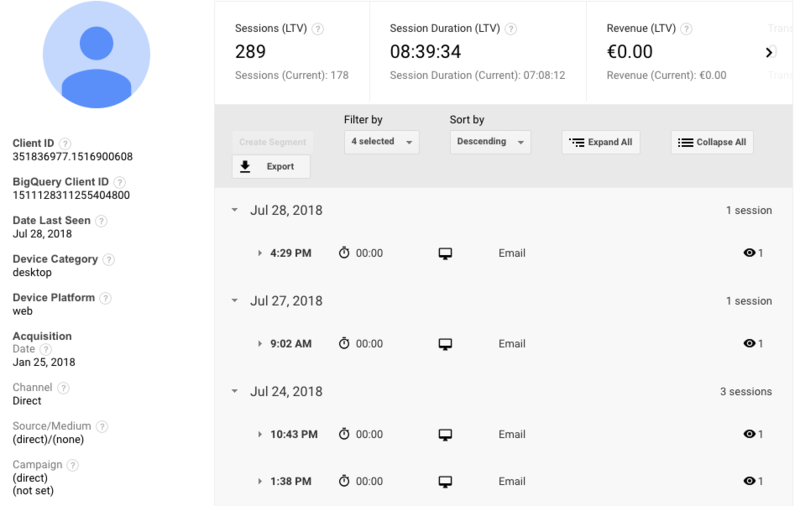 If you look at this report with regard to different target groups (segmentation), and you know which content marketing activities took place in which week thanks to the Google Analytics annotations, this report is a valuable source when it comes to analysis. Without segmentation, the “User Explorer” in the “Audience” main navigation does not make sense. This is where you will find information about the website visits of individual users (Figure 3). Websites with a lot of traffic can have tens of thousands of lines of data here. If you create a segment consisting of converting users of a certain target group, with similar needs, or persona, then you can apply this segment to the “User Explorer”. If you now concentrate on a specific period of time, suddenly there are no longer endless rows of data to be viewed in the report. It now only shows the activities of individual users from the group we have defined who have actually accomplished the targeted actions. Where are micro-goals being achieved? After how many visits to a website is a goal achieved? Where does the attainment of objectives take place? A closer look at this user behavior will reveal patterns. You can see how often which pieces of content were part of the “customer journey” that ultimately led to sales and profits. You will learn in detail how users interact with content which will help you understand which content marketing ideas are beneficial in achieving predefined goals…and which are not! Your goal as an online marketer is always to generate traffic from different channels for the website. This way, you can avoid too much dependence on only one or two sources of traffic. If you are now tracking the achievement of goals broken down according to channels or individual sources, you will notice that some channels and sources perform significantly better than others when it comes to attaining those goals. Does this mean, however, that you have to care less or not at all about the “non-converting” channels and sources? The overview in the “Multi-Channel Funnel“ under the main navigation point “Conversions” provides an answer to this question (Figure 4). Here it is made clear that channels and sources are interdependent with one another for their success. At the time this article was written, Google Analytics assigns a conversion only to the last indirect point of contact. However, users often reach a website several times via many different contact points (touchpoints) before they finally reach one of the targeted objectives. It is quite possible that AdWords or Facebook traffic, for example, prepares conversions that are only triggered by the user at a later visit to the website via another source. Google Analytics does not divide the one conversion into several channels or sources – it only assigns it to the last indirect touchpoint. The “Multi-Channel Funnel” report illustrates that such conversions only occur after several visits across different channels and sources. You can also see which channel and source combinations are very common. These analyses can be performed for each individual conversion type. A selection box is available for this, as well as for certain conversion segments. In combination with the “Preparatory Conversions” report, you are able to effectively assess the value of actively managed channels and sources for content marketing activities. In the world of marketing, the assignment of conversions to the individual “touchpoints” of a “customer journey” is referred to as attribution. Often, there is more than one such touchpoint between the marketing activities of a company and the user before a conversion is triggered. Nevertheless, Google Analytics assigns 100% of each conversion to the last indirect channel. All other touchpoints are ignored. This is not very helpful for the exact allocation of advertising budgets, as each channel within the “customer journey” contributes to the conversion. The model comparison tool in the Analytics menu “Conversions” > “Attribution” is designed to help you get a clearer picture of the contributions each of the individual channels makes to the achievement of the target projects. Compare the standard attribute model “Last interaction” with a “linear” distribution of conversions and value and with the “position-based” approach (Figure 5). This view across all touchpoints makes their importance for the achievement of goals clearer to you. Miscalculations in budget allocation certainly happen less frequently with this knowledge. All reports presented so far in this article are available in Google Analytics by default. However, if you want to carry out analyses specific to your company, it may not be enough to just use the free Google Analytics reports. The web analysis software enables the creation of user-defined dimensions and measured values. In Google Analytics management, setup begins at the property level. Once set up, you can also perform analyses for these individual dimensions using the “Personalize” section where you can create user-defined reports. Of course, these dimensions are also available for assembling segments or as a secondary dimension in the standard reports! Successful authors: Whose articles are most frequently read? Popular categories: Which content topics attract the most interest? Accepted text lengths: How long can product descriptions be without overwhelming users? Current vs. outdated: Is it worth keeping and maintaining a content archive? Influence of the weather: Is there a correlation between sunshine and sales? Bargain hunters vs. premium customers: How do people behave on the website? Combined with standard information from Google Analytics, many compelling conclusions can be drawn about optimization potential and short-term and long-term content marketing successes. Have you downloaded the Google Analytics app to your phone yet? In the app, you will find a special function that does not yet exist in the desktop version of Google Analytics at the time of writing this article. The number of female users from Berlin has increased compared to the previous month. The exit rate on the products page increased compared to the previous week. The conversion rate for Safari users with a screen resolution of 1,920×1,080 has dropped compared to the previous month. By aligning this information with your personas, needs and target groups, you will recognize the significance of this information for achieving your website goals. If you notice that something is going wrong, you can take action to counter the problem. A cleverly chosen strategy makes content marketing successful. Have a clear goal in sight. Adapt the content of your website so that you achieve that goal. Use Google Analytics or another web analytics solution to measure how well you are implementing your strategy. Have sufficient confidence in the web analysis figures, and develop and test hypotheses. This will bring you closer to your defined goals day by day. Good luck! Published on 07/30/2018 by Sven Deutschländer. Sven is managing director of dskom, which has been providing online marketing consulting, seminars and workshops for the last 10 years with its brand “SEO Profi Berlin“. His areas of expertise include SEO, SEM, Social Media and Web Analysis. Sven's SEO Academy, which offers extensive training in online marketing, is particularly important to him.